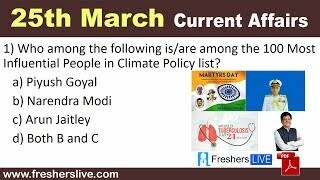 Current Affairs 25th March 2019: Instantly obtain Latest Current Affairs 25th March 2019 with all essential info, Be the first to know all the Current affairs 25th March 2019 top news, Major Issues, Current happenings, Important events in National as well as International level with clear explanation. For all competitive exams and Interviews, equip yourself with the Latest Current Affairs 25th March 2019 granted here. President Ram Nath Kovind administered the oath of office to Justice Pinaki Chandra Ghose as the country’s first Lokpal. The oath was administered at a ceremony held at Rashtrapati Bhavan. Justice Ghose, a former Supreme Court judge, was named the country’s first Lokpal, the anti-corruption ombudsman. Former US president Jimmy Carter has reached a milestone. He was elected as the 39th President, Carter is now the longest living chief executive in American history. Today is the 172nd day beyond Carter's 94th birthday. It exceeds by one day the lifespan of former President George H.W. Bush, who died last November at the age of 94 years, 171 days. India lifted South Asian Football Federation SAFF Women’s Championship fifth time in a row. Keeping its winning streak India defeated host Nepal in the final by 3-1 in Biratnagar, Nepal. India’s Dalmia Chhibber scored first goal of the match in 26th minute. India’s Indumathi Kathiresan and Sabitra Tamang of Nepal remained top scorer of the tournament, both scored four-goal each. Tata Coffee announced the appointment of Chacko Purackal Thomas as the managing director and chief executive officer. He will replace Sanjiv Sarin. He will assume the charge from April 1, 2019.